A guide on how to successfully implement a lighting investment project and generate up to 70% savings on electrical energy. 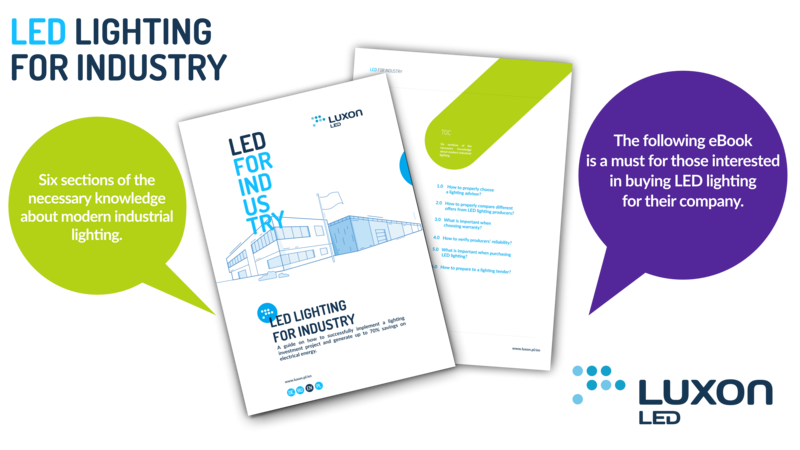 At Luxon, I have had the pleasure to participate directly in hundreds of LED lighting tenders. Among them there were orders for several dozen luminaires as well as large public procurements. When I say large, I mean there is a minimum of 1000 lighting fixtures and the purchase value is from 200,000 to several million PLN. On the basis of these experiences, together with the team, we decided to share our knowledge. The goal of this guide is that You, the Decision Maker, have full knowledge and could independently choose what is best for your company in terms of purchasing LED lighting. Six sections of the necessary knowledge about modern industrial lighting. How to properly choose a lighting advisor? How to properly compare different offers from LED lighting producers? What is important when choosing warranty? How to verify producers’ reliability? How to prepare to a lighting tender?